Sure, your phone and tablet have their own calendar apps that can help you manage your schedule. But there are other options, too. A variety of third-party calendar apps—many of them free—are available, offering smart features, such as social network support, integrated tasks, and customization that your standard calendar lacks. Sunrise takes advantage of the iOS touch screen, allowing you to adjust your view by dragging the screen. Sunrise is as pretty to look at it as it is useful—and it’s very, very useful. This free Android, iOS, and Chrome app connects to various services and networks (iCloud, Google, Facebook, LinkedIn, and more) to provide a full picture of your time commitments. It integrates birthdays, lets you see how much free time you have between events, and even links you directly to driving directions if your appointment is associated with an address. I especially like how the iPhone app lets you drag and adjust the screen to view your month and your day at the same time, a feature lacking from the Google’s iPhone calendar. Sunrise also works in a web browser, making it my desktop and mobile calendar of choice. If you're running late for an appointment, Tempo will send your colleagues a quick message for you. 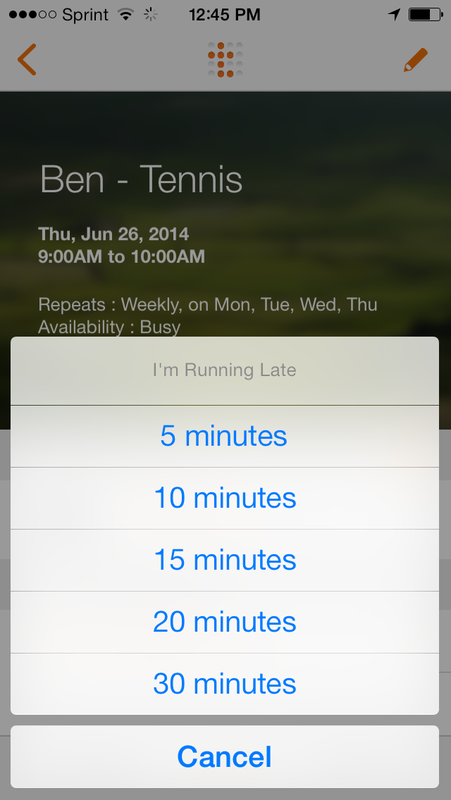 Tempo is a slick calendar solution for iOS users who are always on the go. This free app describes itself as a smart calendar—and it is. 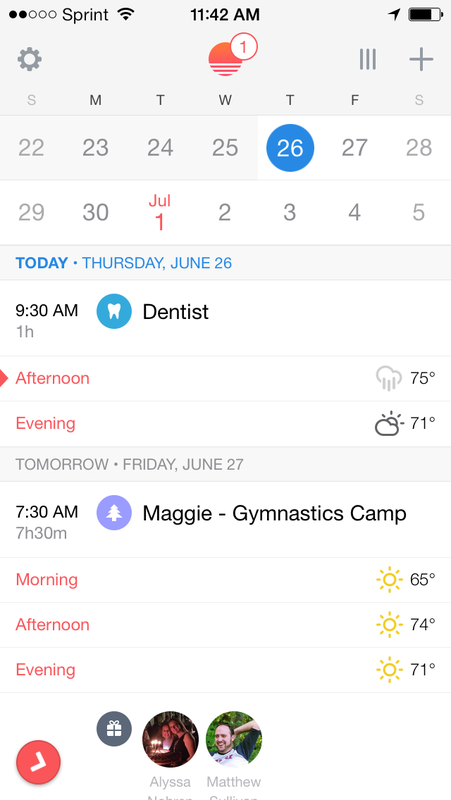 With your permission, Tempo connects with your existing iOS calendar and contacts, as well as your email account, and social networks like Facebook and LinkedIn. It then links your appointments with the people you meet and integrates their contact info right into the calendar view. If you’re running late, you can quickly send all of them a message, telling them when to expect you. Sometimes Tempo can be a little too smart for its own good, though, as it linked my son’s tennis lesson to another colleague of mine with the same name. I also wish it offered a web-based version, as its attractive design would be even more impressive on the big screen. Calendar 5 has an impressive ability to recognize natural language. Calendar 5 is another excellent option for mobile iOS users, albeit a more expensive one. At $7 this iPhone and iPad app is far more expensive than the competition, but it also delivers some worthy features for that price. The first is its streamlined, attractive layout that’s as easy to use on an iPhone screen as it is on the bigger iPad. Adding a task is a breeze, and I like how Calendar 5 recognizes natural language. 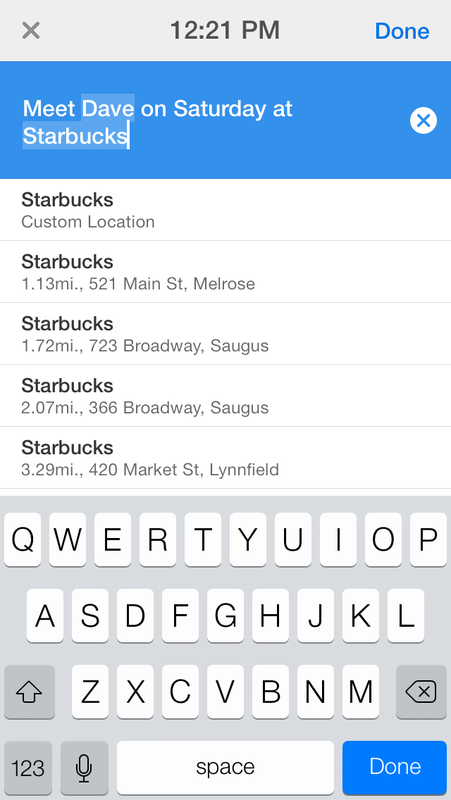 It also integrates tasks and syncs with both your Google calendar and your local iOS calendar. Calendar 5 is so appealing, it’s a shame it’s not available in a web-based version, too. Jorte Calendar & Organizer places a heavy emphasis on the “organizer” part of its name, and that’s a good thing. This free Android app lets you create a task list and associates it with your calendar, so you’ll know when things need to be done. Jorte also offers customizable views, allowing you to change the look and feel of your calendar with colors, skins, and themes—though some of the more light-hearted options won’t appeal to business users who want a professional-looking calendar. Jorte syncs with Google Calendar and does offer a web-based version, though it’s clunky at times. Still, Android users looking for an organizational tool will appreciate what Jorte offers. You can change the color and the font on your Jorte Calendar, but the Web version is clunky at times. aCalendar lets you organize events by color, which makes it easy to evaluate your schedule at a glance.